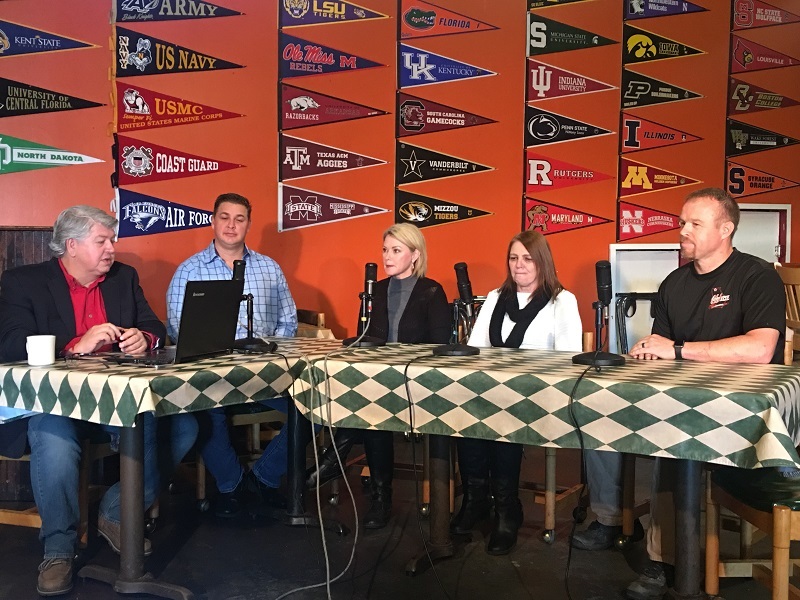 BLUE RIDGE, Ga. – Members of the newly elected 2018 Blue Ridge City Council joined BKP to talk Friday during Good Morning from Blue Jeans Pizza. Incumbent City Council Member Rhonda Thomas along with council members elect Robbie Cornelius, Nathan Fitts and Kenneth Gaddis candidly discussed their goals, plans and hopes for city improvement in the next four years. Incumbent Mayor Donna Whitener and City Council Member Harold Herndon were unable to attend due to other obligations, but both expressed their gratitude to and appreciation of voters after their respective elections to third terms Tuesday. The open forum began with each having the opportunity to thank the voters and share their own thoughts of the upcoming council. Regarding the nature of the election itself, Cornelius stated she was proud of the newly elected members for avoiding some of the negativity that existed during the campaigns. The diversity of the council was one of the topics BKP addressed with the council elect. Gaddis spoke of the differences of experiences and backgrounds of the new council but saw this as a strength. While agreeing with Gaddis, Fitts admitted he knows there will be some disagreement on issues at times. However, he stated this disagreement would be met in a respectful manner. “I don’t think any of us have an issue with stating our opinion … (The citizens) are tired of the fighting and the bickering … I don’t think you’re going to see any of that in the next four years. We certainly won’t ‘take it outside,'” Fitts said, citing a comment passed at a City Council meeting earlier this year. BKP added that he saw a “good balance” with the new council and cited Herndon’s unbiased voting record as another positive moving into the next term. When asked about issues that have plagued the city over the last two terms, veteran council member Thomas said she wants to see a long-term solution to the downtown parking situation addressed by the new council. Thomas again put forth the idea of building a parking deck to alleviate congestion. She also said downtown flooding was another major concern facing the new council. “This has to be resolved. This is a major issue when people’s homes are flooding,” Thomas explained. Among other ideas for the future of the council and the city, Cornelius stated she would like to initiate a quarterly town hall meeting with the citizens of Blue Ridge, and Fitts said the council will be looking into grant options to provide funding for infrastructure improvement. Gaddis also added “re-evaluat(ing) the city attorney (David Syfan), right out of the gate” would be another concern the council will soon address. Adding his thoughts, BKP provided three suggestions, or “requests,” to the incoming council. First, he suggested staggering the elections, having an election for three council members in two years followed by elections of the other two council members and the mayor two years later. Next, he recommended looking at either a strong-mayor as city CEO system or a weak-mayor system along with a city manager. Currently, Blue Ridge operates under a weak-mayor system without a city manager in which the mayor has no authority outside the council. Lastly, BKP encouraged the new council to give more voice to the citizens in public meetings. For the entire segment featuring the newly elected Blue Ridge City Council on Good Morning from Blue Jeans Pizza with BKP, watch FYN TV. And for up-to-date coverage of the council and the city of Blue Ridge, continue to follow FetchYourNews.com.